Privileged investment services designed for a Professional Investor like you. Structured notes are structured products involving derivatives. Investment Fund is an investment product and some Investment Funds would involve derivatives. The investment decision is yours but you should not invest in that investment product unless the intermediary who sells it to you has explained to you that the product is suitable for you having regard to your financial situation, investment experience and investment objectives. Our Investment Advisors will provide you with the latest and most relevant market trends and analysis, helping you to shape and adjust your investment strategy timely. Our Insurance Specialists are committed to understanding your wealth planning objectives across different life stages, and offer tailored insurance advice and solutions covering legacy, retirement planning, life protection, medical and critical illness protection. Client must fulfil the portfolio of securities and money requirement of not less than HK$8 million (or equivalent foreign currency) in order to declare as a Professional Investor (“PI”) and the PI status is subject to the bank’s validation check and approval. 1. The promotion period is from 24 January to 31 March 2019 (both dates inclusive) (the “Promotion Period”). 2. 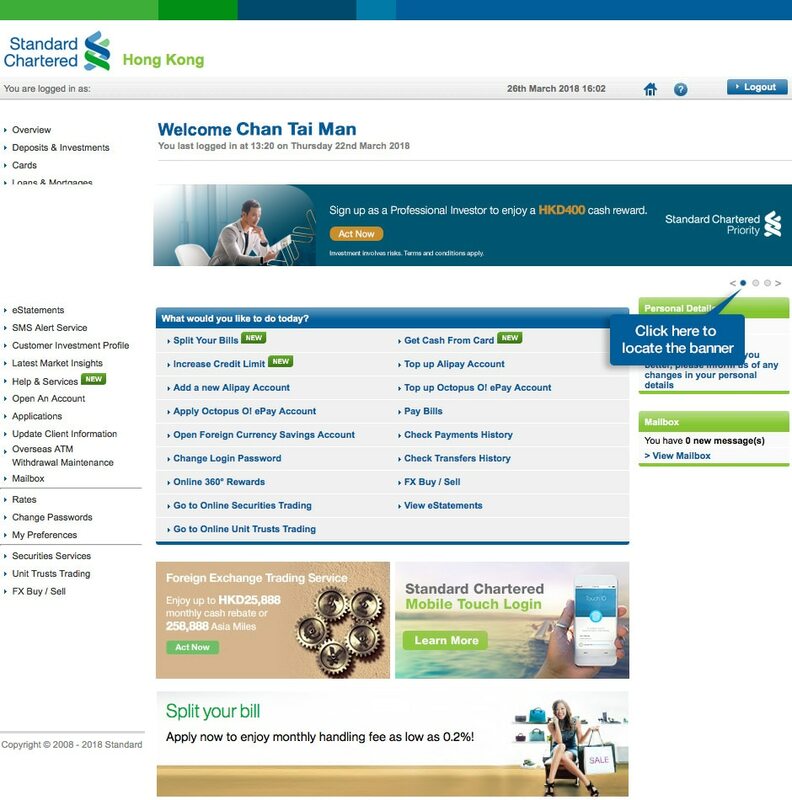 Offer is applicable to clients of Standard Chartered Bank (Hong Kong) Limited (the “Bank”) whose account(s) is/are opened in his/her sole name or joint names or Business Banking clients, but excluding Commercial Banking and Private Banking clients of the Bank (the “Client”). 3. The Client, who fulfils the portfolio of securities and money requirement of not less than HK$8 million (or equivalent foreign currency) and successfully declared as a Professional Investor (“PI”) during the Promotion Period and maintains a PI status until its expiry as specified by the Bank (the “Eligible Client”), will be eligible to receive HK$400 cash reward (the “Cash Reward”). The Client must not have maintained a PI status with the Bank prior to the sign up of this offer. Clients, with PI status with the Bank, if any, that expires between September 1, 2018 and March 31, 2019 (both dates inclusive), will also not be eligible for the offer. 4. A Client’s PI status is subject to the Bank’s validation on the Client’s portfolio of securities and money. 5. Each Eligible Client may only enjoy the Cash Reward once irrespective of the number of times a PI declaration has been made during the Promotion Period. 6. The Cash Reward will be credited to the Eligible Client’s HKD account, either in sole name or joint name, by 31 May 2019 in the following sequence: 1) Integrated Deposits Account, 2) Statement Savings, 3) Passbook Savings or 4) Current Account. If the Eligible Client has more than one account under the same account type, the Bank will select the one with the latest account opening date. 7. The Eligible Client’s banking account held with the Bank and to which the Cash Reward is to be credited must remain valid at the time when the Cash Reward is to be credited. The Eligible Client should notify the Bank on or before 14 June 2019 if he/she does not receive the Cash Reward. Otherwise, the Cash Reward will be forfeited. 8. The Bank reserves the right to terminate, extend or vary this offer and to vary or modify any of its terms and conditions from time to time without prior notice. In case of disputes, the decision of the Bank shall be final and binding. 9. If there is any inconsistency or conflict between the English and the Chinese versions, the English version shall prevail. Risk Disclosure Statement for Debt Securities Services. Investment involves risks. The prices of units / shares of unit trust or mutual funds fluctuate, sometimes dramatically and may become valueless. Investors may not get back the amount they have invested. It is as likely that losses will be incurred rather than profit made as a result of buying and selling unit trusts or mutual funds. Past performance is no guide to its future performance. Customers may be called upon at short notice to deposit substantial additional collateral to maintain their position, and a forced sale of assets, without Customer’s consent, may be necessary, including (but not limited to) in cases where (i) a Customer experiences difficulty in servicing its borrowing under the Facility, (ii) the market value of the collateral falls below the minimum level required by Standard Chartered Bank (Hong Kong) Limited (the “Bank”), (iii) the Lending ratio, Top-up ratio or Sell-down ratio in respect of the collateral is adjusted downwards by the Bank, or (iv) the Bank decides to not to renew the Facility at the annual review. The risk of loss in financing a transaction by deposit of collateral is significant, and Customers may sustain losses in excess of any cash and any other assets deposited as collateral and will remain liable for any resulting deficit in Customer’s account. WealthPro (“Facility”) is subject to annual renewal with credit review by the Bank.